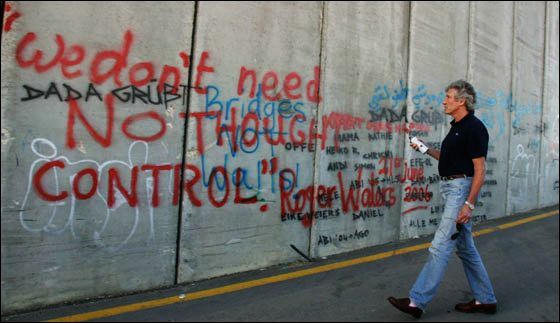 ARt of resistance: Costello, Waters, Rickman and Smith on Israeli – Palestinian conflict. Then there are occasions when merely having your name added to a concert schedule may be interpreted as a political act that resonates more than anything that might be sung and it may be assumed that one has no mind for the suffering of the innocent. I must believe that the audience for the coming concerts would have contained many people who question the policies of their government on settlement and deplore conditions that visit intimidation, humiliation or much worse on Palestinian civilians in the name of national security. I am also keenly aware of the sensitivity of these themes in the wake of so many despicable acts of violence perpetrated in the name of liberation. Some will regard all of this an unknowable without personal experience but if these subjects are actually too grave and complex to be addressed in a concert, then it is also quite impossible to simply look the other way. My thanks also go to the members of the Israeli media with whom I had most rewarding and illuminating conversations. They may regard these exchanges as a waste of their time but they were of great value and help to me in gaining an appreciation of the cultural scene. I hope it is possible to understand that I am not taking this decision lightly or so I may stand beneath any banner, nor is it one in which I imagine myself to possess any unique or eternal truth. It has been necessary to dial out the falsehoods of propaganda, the double game and hysterical language of politics, the vanity and self-righteousness of public communiqués from cranks in order to eventually sift through my own conflicted thoughts. I have come to the following conclusions. Rickman edited and directed a play My name is Rachel Corrie, about Rachel Corrie, american activist killed by IDFs bulldozer in 2003. The play was based on Rachel’s diaries and e-mails home, and was censored (put off stage) several times by some theaters. “Rachel Corrie lived in nobody’s pocket but her own. Whether one is sympathetic with her or not, her voice is like a clarion in the fog and should be heard,” Rickman said then. Watch him talk more about the play in this interview. In 1980, a song I wrote, Another Brick In The Wall part2, was banned by the government of South Africa because it was being used by black South African children to advocate their right to equal education. That apartheid government imposed a cultural blockade, so to speak, on certain songs, including mine. Twenty-five years later, in 2005, Palestinian children participating in a West Bank festival used the song to protest against Israel’s wall around West Bank. They sang: “We don’t need no occupation! We don’t need no racist wall!” At the time, I hadn’t seen firsthand what they were singing about. The Palestinian advocates of a boycott asked that I visit the occupied Palestinian territory to see the wall for myself before I made up my mind. I agreed. Under the protection of the United Nations I visited Jerusalem and Bethlehem. Nothing could have prepared me for what I saw that day. The wall is an appalling edifice to behold. It is policed by young Israeli soldiers who treated me, a casual observer from another world, with disdainful aggression. In my view, the abhorrent and draconian control that Israel wields over the besieged Palestinians in Gaza and the Palestinians in the occupied West Bank (including East Jerusalem), coupled with its denial of the right of refugees to return to their homes in Israel, demands that fair-minded people around the world support the Palestinians in their civil, nonviolent resistance. Where governments refuse to act people must, with whatever peaceful means are at their disposal. For me this means declaring an intention to stand in solidarity, not only with the people of Palestine but also with the many thousands of Israelis who disagree with their government’s policies, by joining the campaign of Boycott, Divestment and Sanctions against Israel. And another, more recent letter by Waters.